Chelsea defender David Luiz has discussed Maurizio Sarri’s epic rant after the 2-0 defeat to Arsenal at the weekend. The Blues were well beaten by the Gunners, who scored two first half goals and looked comfortable throughout their Premier League victory at the Emirates Stadium on Saturday. This led to Sarri publicly slamming his players in his post-match press conference, though Luiz says he understands the Italian tactician’s frustrations. ‘He was not happy, but nobody was happy, so it was normal,’ Luiz is quoted by the Metro. The Brazilian also moved to defend the Blues boss, who has come under fire himself over some questionable tactical decisions. In fairness, it’s hard to see how Chelsea can persist with playing N’Golo Kante as an attacking midfielder, while surely playing any striker is better than using Eden Hazard as a false nine. Still, Luiz insists CFC have made huge progress in a short space of time under Sarri, and called for patience in the former Napoli boss’ project. ‘This is our philosophy, I believe in it, I trust in it, so I just know we have to improve, like every team in the world,’ Luiz added. 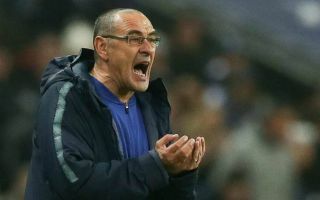 ‘What Sarri has done until now is unbelievable, amazing, because normally a team to understand this philosophy needs one or two years, like Man City and Liverpool, who are playing very well with the ball now. Chelsea are not exactly known for showing patience to managers, so it will be interesting to see how this all pans out if results don’t improve quickly. Where will Chelsea finish this season?